Acrylic is one of the most common materials that vendors use on outdoor and wicker furniture. It is mainly because this material is very easy to clean and maintain. Although it is mostly mildew resistant, some steps can be taken to ensure that the patio cushions are kept clean. The first step is to remove cushions from the frame before you begin cleaning. First spot clean with mild soap and water using a sponge if there are any spots or stains. Rinse with clean water. Then make sure to dry completely before using or storing acrylic cushions, to prevent mildew formation. In some cases, the acrylic patio cushions can be exposed to mildew, especially, if there is a lot of moisture. You can get rid of mildew by cleaning with a solution of one cup bleach, two cups laundry detergent and one gallon of water. It is really important to mix before spraying on the entire cushion thoroughly. Always wear protective eye goggles and gloves when spraying with bleach. Let the mixture soak the cushions and leave for 30 minutes. Then scrub with a sponge. Finally, rinse with clean water and allow complete drying. 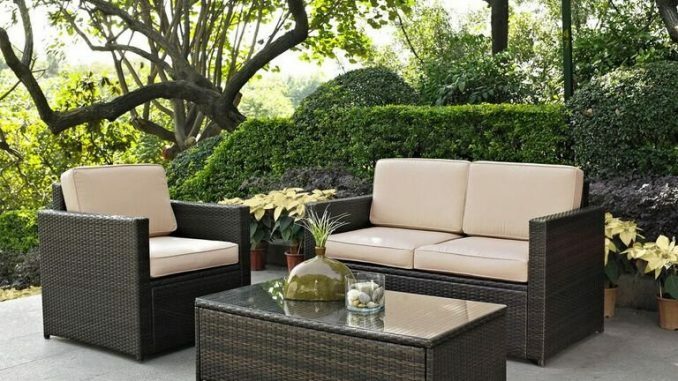 Avoid storing patio cushions in plastic wraps as the plastic does not allow the cushion to breathe, and in case of any moisture, you may find nasty mildew when you bring them out of storage. This guide will prove to be quite helpful in keeping the acrylic patio cushions clean and well maintained. Alternatively, you could buy a set of replacement cushions from a site like Wicker Paradise.